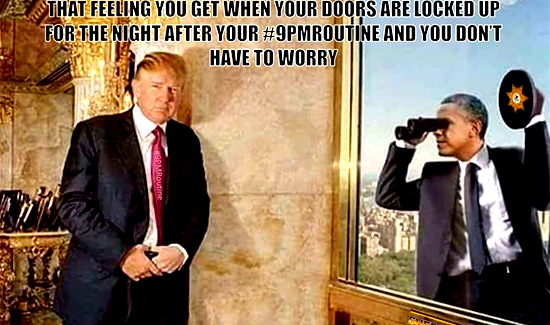 The Kankakee County Sheriff’s Office (IL) has taken some heat for its use of a meme involving President Donald Trump and former President Barack Obama, as part of a social media campaign to remind people to lock their houses and doors at night. The Kankakee County Sheriff’s Facebook and Twitter feeds both feature a meme with a picture of Obama having climbed up the outside of Trump Tower, looking into Trump’s home, while holding binoculars. The images remind people to lock up by 9 p.m., and report suspicious activity to police. On Facebook, comments criticize the sheriff’s office for being racist, by putting out an image of a black man ready to break into a white man’s home. Kankakee County Sheriff Michael Downey said it was nothing of the sort. “If you look at the history of our memes, there’s a lot of those memes that are related to current events, and celebrities, and things like that. So, no, that’s ridiculous,” he said.